Brackley Town Saints head to Wantage Town looking to extend their lead at the top of the UHLSport Hellenic League. 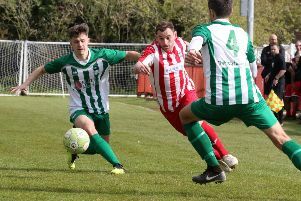 Saints beat Abingdon United 3-1 to go five points clear in the premier division table. Saints started well and took an early lead when top scorer Ryan Knight coolly chipped the keeper after an astute pass from Jordan Godfrey. The home side had an immediate chance to level when Tom Butler took advantage of a defensive slip and found himself through on goal but a good save by Ali Worby maintained his side’s advantage. Abingdon were happy to play out from the back and Saints pressed well putting keeper Jake Pritchard under pressure. Saints extended their lead with a great team goal, full of short passing and great movement, ending with a cute pass from Alex Stott who played Chris Jordan through and he finished precisely past Pritchard into the bottom corner. Abingdon were lively on the break and pulled themselves back into the game when the ball was fed back to Lester Davies and he was given too much time to size up a shot which he duly smashed past Worby. After the restart, Worby was forced to make a great reflex save from Davies and almost immediately the left winger was through again but his shot from a tight angle hit the outside of the post. Saints increased their lead when Ball cut in and out again before his shot ran through to Alex Stott who calmly slotted past the keeper. Ball again cut in and delivered a dangerous dipping cross which was tipped over the bar by Pritchard. Lewis Baldwin was on hand with a great saving clearance after a swift break and Worby was forced to save well from close range. Saints caught Abingdon on the break late on and Ball shot wide but the three points were already in the bag.